Another way to identify a relation between hyperacusis and musicians is to check if hyperacusis is more likely to develop depending on the number of total hours an individual has been practicing and performing as a musician. The 2015 study by Halevi-Katz on pop/jazz/rock musicians found a significant positive correlation between musician experience and reported hyperacusis. With this in mind, it seems likely that hyperacusis can develop as a cumulative effect of sound exposure. 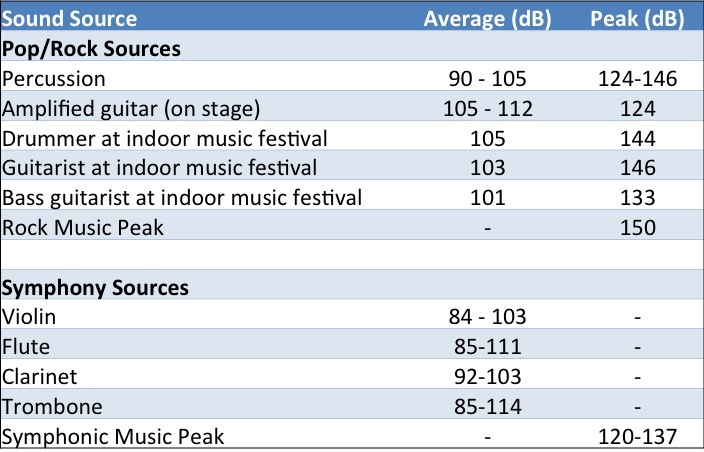 Below is a list of decibel levels that can be experienced by musicians regularly. Cumulative cochlear and neurological damage can occur even in those that show normal hearing tests. See hidden hearing loss for more information. Have ideas on how to make this article better? Please contact [email protected]. Anari M, Axelsson Alf, Eliasson A, Magnusson L. Hypersensitivity to Sound: Questionnaire data, audiometry and classification. Scand Audiol 1999:28:219-230. Schmuziger N, Patscheke J, Probst R. Hearing in nonprofessional pop/rock musicians. Ear Hear 2006:27(4):321-330. Halevi-Katz D, Yaakobi E, Putter-Katz H. Exposure to music and noise-induced hearing loss (NIHL) among professional pop/rock/jazz musicians. Noise & Health 2015:17(76):158-164. Jansen E, Helleman H, Dreschler W, de Laat J. Noise induced hearing loss and other hearing complaints among musicians of symphony orchestras. Int Arch Occup Environ Health. 2009:82(2):153-164. Kähärit K, Zachau G, Eklöf M, Sandsjö L, Möller C. Assessment of hearing and hearing disorders in rock/jazz musicians. Int J Audiol. 2003:42(5):279-288.